Bush WS, Crosslin DR, Owusu-Obeng A, Wallace J, Almoguera B, Basford MA, Bielinski SJ, Carrell DS, Connolly JJ, Crawford D, Doheny KF, Gallego CJ, Gordon AS, Keating B, Kirby J, Kitchner T, Manzi S, Mejia AR, Pan V, Perry CL, Peterson JF, Prows CA, Ralston J, Scott SA, Scrol A, Smith M, Stallings SC, Veldhuizen T, Wolf W, Volpi S, Wiley K, Li R, Manolio T, Bottinger E, Brilliant MH, Carey D, Chisholm RL, Chute CG, Haines JL, Hakonarson H, Harley JB, Holm IA, Kullo IJ, Jarvik GP, Larson EB, McCarty CA, Williams MS, Denny JC, Rasmussen-Torvik LJ, Roden DM, Ritchie MD,. Genetic variation can affect drug response in multiple ways, although it remains unclear how rare genetic variants affect drug response. 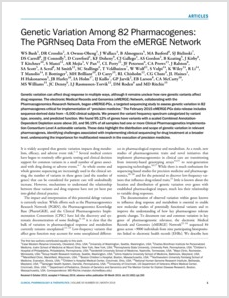 The electronic Medical Records and Genomics (eMERGE) Network, collaborating with the Pharmacogenomics Research Network, began eMERGE-PGx, a targeted sequencing study to assess genetic variation in 82 pharmacogenes critical for implementation of “precision medicine.” The February 2015 eMERGE-PGx data release includes sequence-derived data from 5,000 clinical subjects. We present the variant frequency spectrum categorized by variant type, ancestry, and predicted function. We found 95.12% of genes have variants with a scaled Combined Annotation-Dependent Depletion score above 20, and 96.19% of all samples had one or more Clinical Pharmacogenetics Implementation Consortium Level A actionable variants. 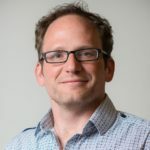 These data highlight the distribution and scope of genetic variation in relevant pharmacogenes, identifying challenges associated with implementing clinical sequencing for drug treatment at a broader level, underscoring the importance for multifaceted research in the execution of precision medicine. Posted in Dana Crawford, Publications, Will Bush.